Determining the true return-on-investment (ROI) of workplace wellness programs is nearly impossible because of the multi-faceted nature of its effects, which is why employers are moving to a value-on-investment (VOI) approach. Hurdles in quantifying gains from wellness investments also create challenges for human resource departments when justifying the cost to the C-suite. Further complicating the matter (in a good way) is a new study from France on the link between obesity and impaired decision-making. 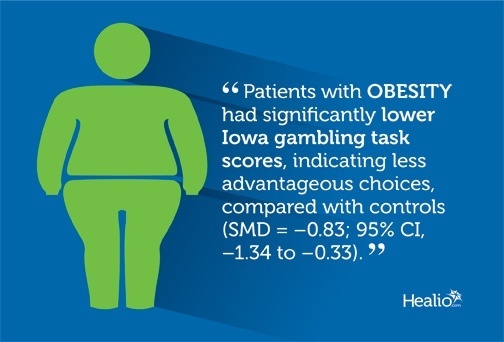 In the study, researchers reviewed seven studies that compared Iowa gambling task results, the “gold standard for studying decision-making abilities,” for 250 patients with obesity and 362 healthy controls. When contingency plans were not available, obese individuals performed at similar levels compared to their healthy counterparts. However, when contingency plans were available, the obese subjects did significantly worse. The authors of the study interpreted this result as riskier decision-making on the part of the obese individuals. According to Dr. Jean-Yves Rotge, the results are consistent with previous reports on the “impairments in executive functions associated with obesity both in children and adults.” While there are some inconsistencies across studies on this topic, this recent qualitative review highlighted large deficits in decision-making, planning, or problem-solving in obese patients.